The jtool command is meant to meet and exceed the functionality to XCode's otool(1), picking up along the way additional Mach-O commands such as atos(1), dyldinfo(1), nm(1), segedit(1), pagestuff(1), strings(1) , and even codesign(1) and the informal ldid. jtool also provides novel features, such in-binary search functionality, symbol injection and a disassembler functionality with (limited but constantly improving) emulation capabilities. It also provides color output. Most importantly, it can be run on a variety of platforms - OS X, iOS, and even Linux. It is ENTIRELY FREE for use of any type, and the latest version can always be found right here. --jtooldir _path_   	path to search for companion jtool files (default: $PWD). Notice in the above use of -v, which adds verbosity - in the case of LC_SEGMENT commands, the file mappings. You can specify the architecture with -arch, or specify ARCH= as an environment variable. This makes it useful to set a default. The last option there seems unusual - after all, how many architectures can there be in a fat file? Yeah, well, I thought so too, until I encountered TaiG's 8.4 Jailbreak, which not only uses fat binaries of some 26-27 architectures, but also uses duplicate entries - confusing otool since it only matches the first one - but jtool can single out a particular slice this way. (q.v my writeup on that jailbreak here for an example). Since jtool basically mimics dyldinfo 1:1, refer to the latter's man(1) page for more detail. I use -function_starts, -bind and -lazy_bind most often. -S does the same thing that nm(1) does. The option is simply -S (uppercase) and -v for full info (as in, which dylib the symbol is in). For nm, that -v is -m. Unlike dyldinfo, the options aren't compatible. Well, not quick, maybe (it grows on you), but certainly efficient. Code signing options are, IMHO, the 2nd most useful feature of JTool. With iOS security revolving around code signatures and entitlements, it's important to have a way to quickly determine what given entitlements a binary possesses and how it is signed. OS X has codesign(1), but I find it crude (at best) - and what more there's no port to iOS, where it's really necessary. Once again, this is designed with shell scripting and grep(1) in mind, so you can do a for file in /usr/libexec/*; do jtool --ent $file; done or other pattern, to get all those undocumented entitlements used by Apple all over the place (I'm also in the process of compiling those into a database I'll share freely when I'm done). There's a reason why that warning is there, and why the default is to write out to an out.bin, rather than in-place - code signatures are a risky business, and may be hard or impossible to reproduce if lost. Be warned. Allocating code signature superblob of 669 bytes, with 3 sub-blobs.. Setting LC_CODE_SIGNATURE's blob size to match CS Blob size.. Calculating Hashes to fill code slots..
Apple prelinks most dylibs and plugins into a "Shared Library Cache". The SLC is located in /var/db/dyld (OS X) and /System/Library/Caches/com.apple.dyld (iOS). The OS X cache also has a "map", but the iOS one doesn't have a map. Jtool can easily decache files - simply use -e dylib on a cache file to get your dylib. Note that the extracted dylib will be big - circa 50MB - because JTool does not deconstruct the merged __LINKEDIT segment. Note that this is done by reconstructing the classes without linking with Apple's Objective-C library so it also works on the Linux version! However, because I do the class walking by myself it might be A) still a bit slow (Springboard is a prime example, with countless classes) and B) possibly buggy. You can use NOOBJC=1 to disable objective-c, but please let me know if you encounter bugs here. You can try this on the OS X kernel for fun (that's /System/Library/Kernels/kernel), but doing so on the iOS kernel is even more useful. That said, there's also Joker for that. More robust OBJ-C handling - won't crash as much. And please see note below on reporting crashes! New option: -D: to decompile - like -d, but will only show "; " lines, i.e. lines that Jtool decompiled. You could always do that with grep(1), but color got confusing. Forget extracting from the Shared Library Cache! jtool can now resolve all symbols in the cache, even when they are in a different dylib! This is super useful because AAPL's reconstructed libraries (in ~/Library/Developer/Xcode/*DeviceSupport) lose external symbols and mess up some __DATA refs. Note that SLC files still have private symbols <redacted>. Working on it. # C) jtool does everything in the cache, no need to extract! _BKSTouchDeliveryPolicyServerGetProxyWithErrorHandler: # No mach_msg here either..
; _mach_msg(0)  # OK, so it's not perfect -- I don't follow FP operations (yet)! jtool has long been able to work on dylibs inside the shared cache - and actually has the ability to symbolicate references which would otherwise be lost when extracting - no matter how sophisticated your "decache" script is, as soon as the file is outside the cache any references to other files still in the cache are effectively lost. AAPL keeps modifying the various ways calls can be made - either by resolved stubs, direct calls to the function or (as of DYLD-5xx) "branch islands". But jtool supports them all. 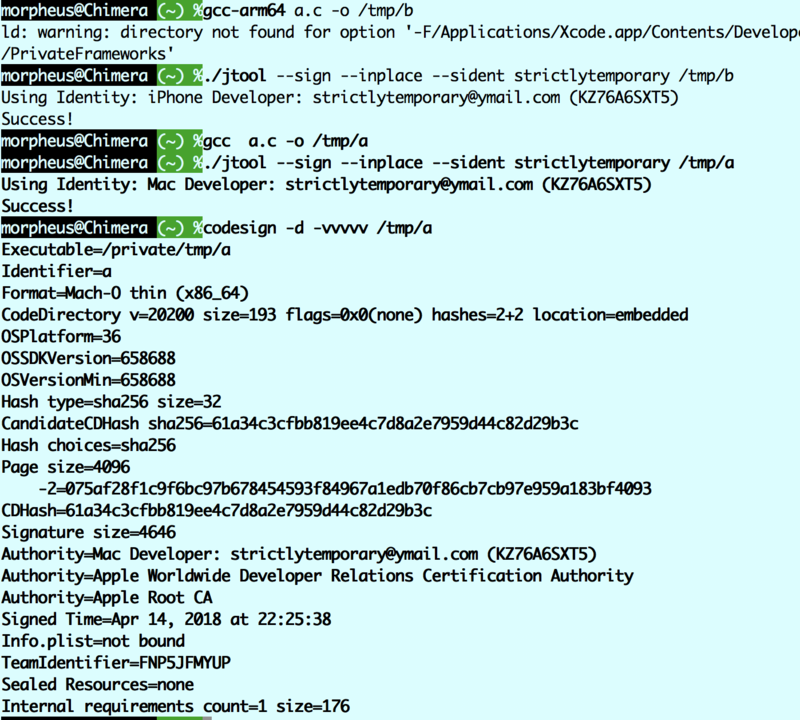 jtool (on MacOS) now uses security framework APIs if you specify --sident (not to be confused with --ident, for the Code Directory Identity) , and specify a partial name or Apple ID or Team ID. There's much more, but I'll pick this up later. 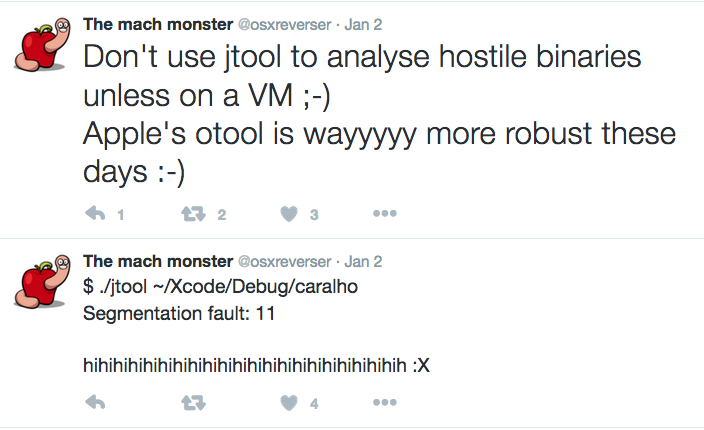 If you use jtool and find bugs, don't just complain silently - LET ME KNOW and I'll be glad to fix. Likewise if you have any suggestions for improvement. Remember - I build the functionality around my own use cases - and I'll be happy to adjust if you have any others. And I don't care if you use IDA or IDA can do this (if they can't, they'll adopt this in their next version) or there's IDAPython, or whatever. This is the tool I use, I find it useful, and I'm encouraging others to use it (freely, unlike IDA/Hopper and their ilk) and suggest improvements. Is this open source? No. Neither is my other reversing tool, Dextra (for Android). Free, yes. But not open source. *Why* is this not open source? Is Hopper? Is IDA? So I'm in good company :-) jtool started as a simple otool -l, but things spiraled out of control when I started doing the disassembly. There's just too much original code in there for me to just share with whatever license, that others can rip and not even mention credit in passing. Sorry. I speak from bitter experience here. It's still FREE though, which is more than what most tools (save, of course, otool) can say. Can I write plugins? better. You can script it with shell commands (it's designed to be grep(1) and other filter-friendly), and you can write entire programs to use jtool's logic - machlib and disarm - as dylibs. What's up with color? Why is it disabled when I pipe, and messy when I JCOLOR=1 and pipe? Because color is done via curses. It's the default when you DON't pipe (i.e. jtool detects the stdout is a tty), and when you do it's disabled unless you insist (JCOLOR=1 or export...). But if you do that, use less -R so less (which is more) can handle the sequences. Or try --html for colorized, hyperlinked HTML output you can save to a file. What can we do that will be COUNTER productive, and not in any way contribute? and you can NOT read the manual page which distinctly says that jtool does crash in some cases. 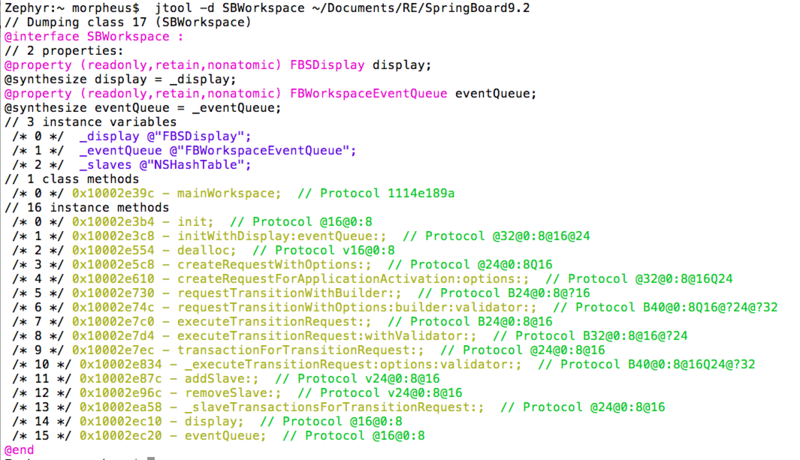 I wish you could use otool instead, but AAPL ruined what was good in it by rewriting it to use objdump. Seriously, IF JTOOL CRASHES FOR YOU, LET ME KNOW AND I'LL FIX IT. COMPLAINING ACHIEVES NOTHING, AND THERE IS AN INSANE AMOUNT OF LOGIC IN JTOOL, SO YEAH, IT AIN'T PERFECT. But hey - it leaves otool in ashes, and it's FREE. I don't expect thanks, but just slamming the tool and not even reporting a bug is being a douche. And what about that MOXIiI 2.0 already!? Volume I will be out by July 2017. What do we do till then?! Err.. enjoy life? Use the OS X Book Forum to ask me anything? Or come to the OS X/iOS Training courses I do for Technologeeks?.